1.1. This Regulation applies to the approval of vehicles of category M1 and N1 (1) with regard to their brake assist system. Vehicles fitted for invalid drivers. ‘Approval of a vehicle’ means the approval of a vehicle type with regard to brake assist system. The design of the Brake Assist System. ‘Maximum mass’ means the maximum mass stated by the vehicle manufacturer to be technically permissible (this mass may be higher than the ‘permissible maximum mass’ laid down by the national administration). ‘The distribution of mass among the axles’ means the distribution of the effect of the gravity on the mass of the vehicle and/or its contents among the axles. ‘Wheel/axle load’ means the vertical static reaction (force) of the road surface in the contact area on the wheel/wheels of the axle. Is sufficient to cause full cycling of the Anti-lock Braking System. Detailed drawings of each component to enable it to be easily located and identified. 4.1. If the vehicle type submitted for approval pursuant to this Regulation meets the requirements of paragraphs 5 and 6 below, approval of that vehicle type shall be granted. 4.3. Notice of approval or of refusal of approval of a vehicle type pursuant to this Regulation shall be communicated to the Contracting Parties to the Agreement which apply this Regulation by means of a form conforming to the model in Annex 1 to this Regulation and of a summary of the information contained in the documents referred to in paragraphs 3.2.1 to 3.2.4 above, the drawings supplied by the applicant for approval being in a format not exceeding A4 (210 × 297 mm), or folded to that format, and on an appropriate scale. The number of this Regulation, followed by the letter ‘R’, a dash and the approval number to the right of the circle prescribed in paragraph 4.4.1 above. 4.5. If the vehicle conforms to a vehicle type approved under one or more other Regulations, annexed to the Agreement, in the country which has granted approval under this Regulation, the symbol prescribed in paragraph 4.4.1 above, need not be repeated; in such a case, the Regulation and approval numbers and the additional symbols of all the regulations under which approval has been granted in the country which has granted approval under this Regulation shall be placed in vertical columns to the right of the symbol prescribed in paragraph 4.4.1 above. 5.1. Vehicles shall be equipped with a brake assist system meeting the functional requirements specified in paragraph 6 of this Regulation. Compliance with these requirements shall be demonstrated by meeting the provisions of paragraphs 8 or 9 of this Regulation under the test requirements specified in paragraph 7 of this Regulation. In addition to the requirements of this Regulation, vehicles shall also be equipped with ABS in accordance with the technical requirements of UN Regulation No 13-H. The 04 series of amendments for vehicles with a coupling system for charging the Rechargeable Electric Energy Storage System (traction batteries). 5.5. The assessment of the safety aspects of BAS shall be included in the overall safety assessment of the braking system as specified in Regulation No 13-H requirements associated with complex electronic control systems. This is deemed to be fulfilled on the presentation of a Regulation No 13-H certificate which includes the BAS to be approved. Compliance with this requirement is demonstrated if the provisions of paragraphs 8.1 to 8.3 of this Regulation are met. Compliance with this requirement is demonstrated if the provisions of paragraphs 9.1 to 9.3 of this Regulation are met. Brake pedal speed, vp, measured at the centre of the pedal plate or at a position on the pedal mechanism where the displacement is proportional to the displacement at the centre of the pedal plate allowing simple calibration of the measurement. 7.2.1. The variables listed in paragraph 7.1 above shall be measured by means of appropriate transducers. Accuracy, operating ranges, filtering techniques, data processing and other requirements are described in ISO Standard 15037-1: 2006. 7.2.4. Alternative measuring methods to those referred to in paragraph 7.2.3 may be allowed, provided they demonstrate at least an equivalent level of precision. 7.4.1. The tests as described in paragraphs 8 and 9 of this section shall be carried out from a test speed of 100 ± 2 km/h. The vehicle shall be driven at the test speed in a straight line. 7.4.2. The average temperature of the service brakes on the hottest axle of the vehicle, measured inside the brake linings or on the braking path of the disc or drum, shall be between 65 and 100 °C prior to any brake application. A category ‘A’ BAS shall meet the test requirements contained in paragraphs 8.1 and 8.2. Vehicle deceleration to brake pedal force. 8.2.2. 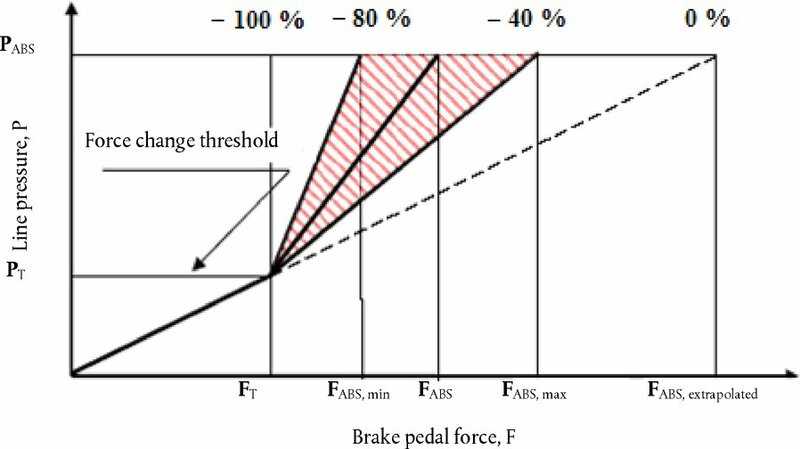 The performance requirements for a category ‘A’ BAS are met if a specific brake application characteristic can be defined that exhibits a decrease of between 40 per cent and 80 per cent in required brake pedal force for (FABS – FT) compared to (FABS extrapolated – FT). 8.2.3. FT and aT are threshold force and threshold deceleration as shown in Figure 1. The values of FT and aT shall be supplied to the Technical Service at the time of submission of the type-approval application. The value of aT shall be between 3,5 m/s2 and 5,0 m/s2. 8.2.5. As an alternative, which can be selected by the manufacturer, in the case of vehicles of category N1, or M1 derived from those N1 vehicles, with a gross vehicle mass GVM > 2 500 kg, the pedal force figures for FT, FABS,min, FABS,max and FABS,extrapolated may be derived from the brake line pressure response characteristic instead of the vehicle deceleration characteristic. This shall be measured as the brake pedal force is increasing. 8.2.5.2. The threshold pressure PT shall be stated by the manufacturer and correspond to a deceleration in the range of 2,5 – 4,5 m/s2. A category ‘B’ BAS shall meet the test requirements contained within paragraphs 9.1 and 9.2 of this section. The vehicle shall be driven in a straight line at the test speed specified in paragraph 7.4 of this Regulation. The driver shall apply the brake pedal quickly according to Figure 2, simulating emergency braking so that BAS is activated and ABS is fully cycling. In order to activate BAS the brake pedal shall be applied as specified by the car manufacturer. The manufacturer shall notify the Technical Service of the required brake pedal input at the time of submission of the application for type-approval. It shall be demonstrated to the satisfaction of the Technical Service that the BAS activates under the conditions specified by the manufacturer in accordance with paragraph 16.1.1 or 16.1.2 of Annex 1. 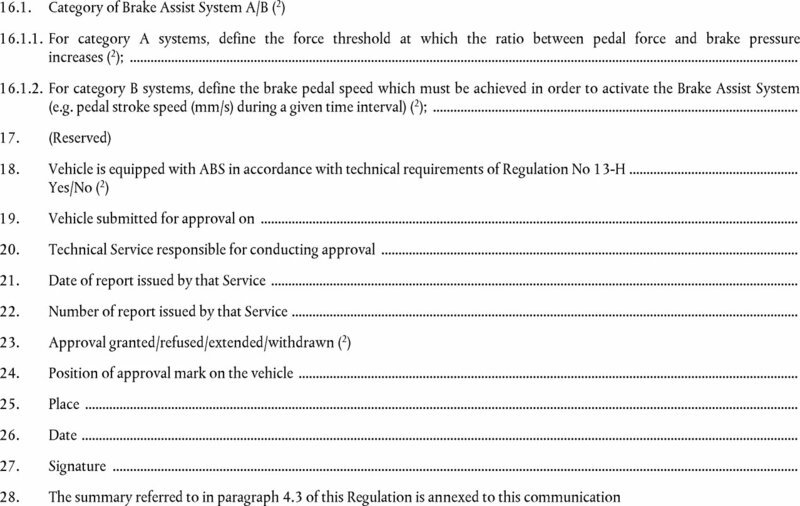 After t = t0 + 0,8 s and until the vehicle has slowed down to a speed of 15 km/h, the brake pedal force shall be maintained in a corridor between FABS, upper and FABS, lower, where FABS, upper is 0,7 FABS and FABS, lower is 0,5 FABS. The requirements are also considered to be met if, after t = t0 + 0,8 s, the pedal force falls below FABS, lower provided the requirement of paragraph 9.3 is fulfilled. 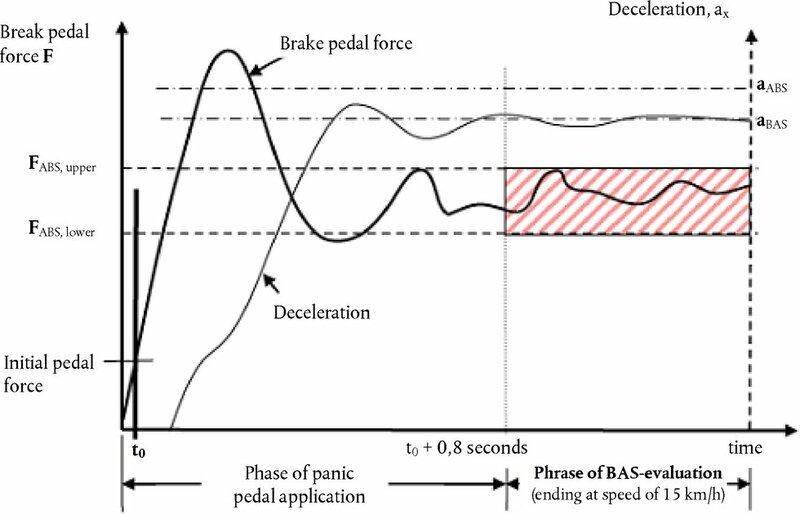 The presence of BAS ‘B’ is demonstrated if a mean deceleration (aBAS) of at least 0,85 · aABS is maintained from the time when t = t0 + 0,8 s to the time when the vehicle speed has been reduced to 15 km/h. Apply the procedure contained in paragraph 10.1.1 (Revision) and, if applicable, the procedure contained in paragraph 10.1.2 (Extension). When particulars recorded in the information documents have changed and the Type Approval Authority considers that the modifications made are unlikely to have appreciable adverse effects and that in any case the foot controls still meet the requirements, the modification shall be designated a ‘revision’. Approval to a later series of amendments is requested after its entry into force. 10.2. Confirmation or refusal of approval, specifying the alteration, shall be communicated by the procedure specified in paragraph 4.3 above to the Contracting Parties to the Agreement applying this Regulation. In addition, the index to the information documents and to the test reports, attached to the communication document of Annex 1, shall be amended accordingly to show the date of the most recent revision or extension. 10.3. The competent authority issuing the extension of approval shall assign a serial number to each communication form drawn up for such an extension. 11.1. A vehicle approved to this Regulation shall be so manufactured as to conform to the type approved by meeting the requirements set forth in paragraphs 5 and 6 above. 12.1. The approval granted in respect of a vehicle type pursuant to this Regulation may be withdrawn if the requirements laid down in paragraph 11.1 above are not complied with. (2) As declared by the vehicle manufacturer. (*1) Applicable as specified in paragraph 8.2.5. (1) Distinguishing number of the country which has granted, extended, refused or withdrawn approval (see approval provisions in the Regulation). The above approval mark affixed to a vehicle shows that the vehicle type concerned has been approved in Belgium (E 6) with regard to the Brake Assist System pursuant to Regulation No 139. The first two digits of the approval number indicate that the approval was granted in accordance with the requirements of Regulation No 139 in its original form. The above approval mark affixed to a vehicle shows that the vehicle type concerned has been approved in Belgium (E 6) pursuant to Regulations Nos 139 and 24 (1). (In the case of the latter Regulation the corrected absorption coefficient is 1,30 m-1). The approval numbers indicate that, at the dates when the respective approvals were given, Regulation No 139 was in its original form and Regulation No 24 included the 02 series of amendments. (1) This number is given merely as an example. 1.2. The brake pedal shall be applied slowly (without activating the BAS in the case of category B systems) providing a constant increase of deceleration until ABS is fully cycling (the figure). 1.3. The full deceleration must be reached within the timeframe of 2,0 ± 0,5 s. The deceleration curve, recorded against time, must be within a corridor of ± 0,5 s around the centre line of the deceleration curve corridor. The example in the figure has its origin at the time t0 crossing the aABS line 2 seconds. Once full deceleration has been achieved, the brake pedal shall be operated so that the ABS continues fully cycling. The time of full activation of the ABS system is defined as the time when pedal force FABS is achieved. The measurement shall be within the corridor for variation of increase in deceleration (see figure below). 1.4. Five tests meeting the requirements of paragraph 1.3 shall be carried out. For each of these valid tests the vehicle deceleration shall be plotted as a function of the recorded brake pedal force. Only data recorded at speeds above 15 km/h shall be taken for the calculations described in the following paragraphs. 1.6. The five individual ‘deceleration versus brake pedal force’ curves are averaged by calculating the mean deceleration of the five individual ‘deceleration vs. brake pedal force’ curves at increments of 1 N pedal force. 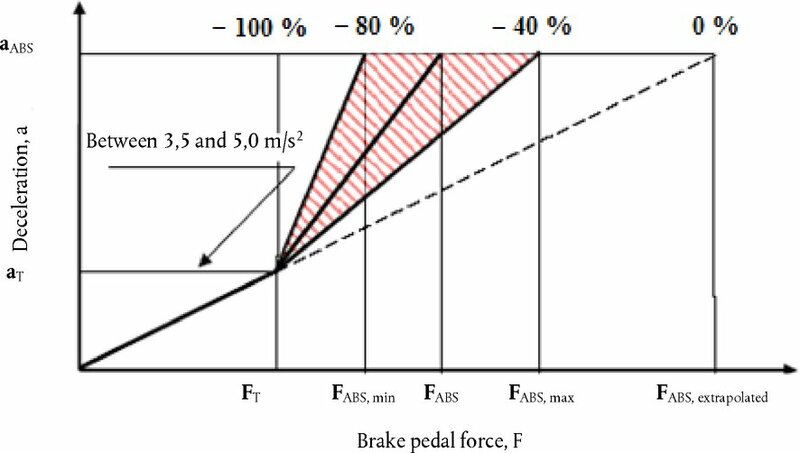 The result is the mean deceleration versus brake pedal force curve, which will be referred to as the ‘maF curve’ in this annex. 1.7. The maximum value for the vehicle deceleration is determined from the ‘maF curve’ and is named as ‘amax’. 1.8. All values of the ‘maF curve’ that are above 90 per cent of this deceleration value ‘amax’ are averaged. This value of ‘a’ is the deceleration ‘aABS’ referred to in this Regulation. 1.9. 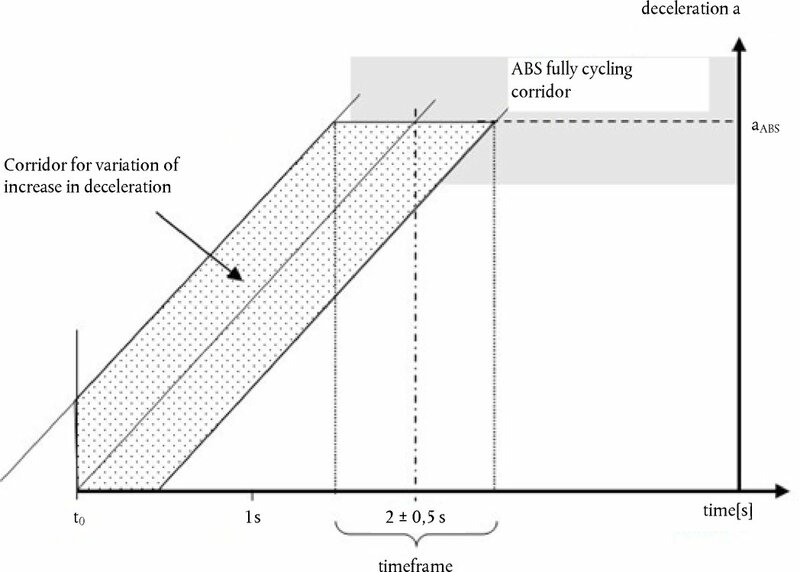 The minimum force on the pedal (FABS) sufficient to achieve the deceleration aABS is defined as the value of F corresponding to a = aABS on the maF curve. In order to execute the necessary filtering of signals, low-pass filters with order 4 or higher shall be employed. The width of the pass band (from 0 Hz to frequency fo at – 3 dB) shall not be less than 30 Hz. Amplitude errors shall be less than ± 0,5 per cent in the relevant frequency range of 0 Hz to 30 Hz. All analogue signals shall be processed with filters having sufficiently similar phase characteristics to ensure that time delay differences due to filtering lie within the required accuracy for time measurement. Note: During analogue filtering of signals with different frequency contents, phase shifts can occur. Therefore, a data processing method, as described in paragraph 2 of this annex, is preferable. Preparation of analogue signals includes consideration of filter amplitude attenuation and sampling rate to avoid aliasing errors, and filter phase lags and time delays. Sampling and digitizing considerations include pre-sampling amplification of signals to minimize digitizing errors; number of bits per sample; number of samples per cycle; sample and hold amplifiers; and time-wise spacing of samples. Considerations for additional phaseless digital filtering include selection of pass bands and stop bands and the attenuation and allowable ripple in each; and correction of filter phase lags. Each of these factors shall be considered in order to achieve a relative overall data acquisition accuracy of ± 0,5 per cent. At one-half the sampling rate (i.e. the Nyquist or ‘folding’ frequency) the magnitudes of all frequency components of signal and noise are reduced to less than the system resolution. For 0,05 per cent resolution the filter attenuation shall be less than 0,05 per cent in the frequency range between 0 and 30 Hz, and the attenuation shall be greater than 99,95 per cent at all frequencies greater than one-half the sampling frequency. fN is the Nyquist or ‘folding’ frequency. for A = 0,0005: fS = 2 · (6,69 · fo), where fS, is the sampling frequency = 2 · fN. 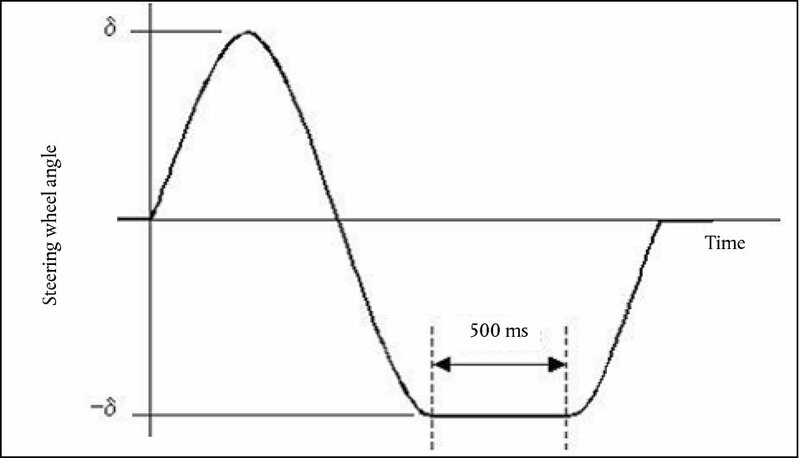 At 30 Hz the signal amplitude changes by up to 18 per cent per millisecond. To limit dynamic errors caused by changing analogue inputs to 0,1 per cent, sampling or digitizing time shall be less than 32 μs. All pairs or sets of data samples to be compared shall be taken simultaneously or over a sufficiently short time period. The data system shall have a resolution of 12 bits (± 0,05 per cent) or more and an accuracy of ± 0,1 per cent (2 lb). Anti-aliasing filters shall be of order 4 or higher and the relevant data range fmax shall be 0 Hz to 30 Hz. For fourth order filters the pass-band frequency fo (from 0 Hz to frequency fo) shall be greater than 2,37 · fmax if phase errors are subsequently adjusted in digital data processing, and greater than 5 · fmax otherwise. For fourth order filters the data sampling frequency fs shall be greater than 13,4 · fo. 1.1. This Regulation applies to the approval of vehicles of category M1 and N1 (1) with regard to their electronic stability control system. ‘Approval of a vehicle’ means the approval of a vehicle type with regard to electronic stability control. The design of the Electronic Stability Control system. ‘Ackermann steer angle’ means the angle whose tangent is the wheelbase divided by the radius of the turn at a very low speed. ‘Lateral acceleration’ means the component of the acceleration vector of a point in the vehicle perpendicular to the vehicle x axis (longitudinal) and parallel to the road plane. ‘Oversteer’ means a condition in which the vehicle's yaw rate is greater than the yaw rate that would occur at the vehicle's speed as a result of the Ackermann steer angle. ‘Side-slip or side-slip angle’ means the arctangent of the ratio of the lateral velocity to the longitudinal velocity of the centre of gravity of the vehicle. ‘Understeer’ means a condition in which the vehicle's yaw rate is less than the yaw rate that would occur at the vehicle's speed as a result of the Ackermann steer angle. ‘Yaw rate’ means the rate of change of the vehicle's heading angle measured in degrees/second of rotation about a vertical axis through the vehicle's centre of gravity. ‘Peak braking coefficient (PBC)’: means the measure of tyre to road surface friction based on the maximum deceleration of a rolling tyre. ‘Common space’ means an area on which more than one tell-tale, indicator, identification symbol, or other message may be displayed but not simultaneously. ‘Static stability factor’ means one-half the track width of a vehicle divided by the height of its centre of gravity, also expressed as SSF = T/2H, where: T = track width (for vehicles with more than one track width the average is used; for axles with dual wheels, the outer wheels are used when calculating ‘T’) and H = height of the centre of gravity of the vehicle. 4.1. 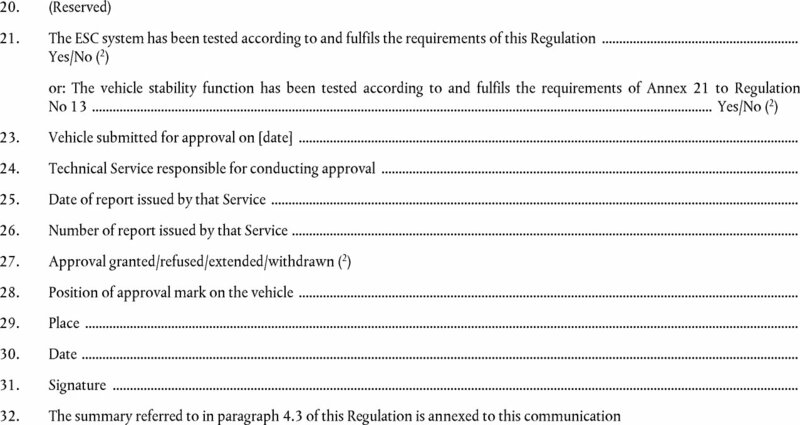 If the vehicle type submitted for approval pursuant to this Regulation meets the requirements of paragraphs 5, 6 and 7 below, approval of that vehicle type shall be granted. 5.1. Vehicles shall be equipped with an ESC system that meets the functional requirements specified in paragraph 6 and the performance requirements in paragraph 7 under the test procedures specified in paragraph 9 and under the test conditions specified in paragraph 8 of this Regulation. 5.1.1. As an alternative to the requirements of paragraph 5.1, vehicles of categories M1 and N1 with a mass in running order of more than 1 735 kg may be equipped with a vehicle stability function which includes roll-over control and directional control and meets the technical requirements and transitional provisions of Regulation No 13, Annex 21. These vehicles do not need to meet the functional requirements specified in paragraph 6 and the performance requirements specified in paragraph 7 under the test procedures specified in paragraph 9 and under the test conditions specified in paragraph 8 of this Regulation. 5.5. The assessment of the safety aspects of ESC, with respect to its direct effect on the braking system, shall be included in the overall safety assessment of the braking system as specified in Regulation No 13-H requirements associated with complex electronic control systems. This is deemed to be fulfilled on the presentation of a Regulation No 13-H certificate which includes the ESC system to be approved. 5.6.2. At the time of type approval, the means implemented to protect against simple unauthorised modification of the operation of the warning signals shall be confidentially outlined. Alternatively, this protection requirement is fulfilled when a secondary means of checking the correct operational status is available. When the vehicle is being driven in reverse. During each test performed under the test conditions of paragraph 8. and the test procedure of paragraph 9.9, the vehicle with the ESC system engaged shall satisfy the directional stability criteria of paragraphs 7.1 and 7.2, and it shall satisfy the responsiveness criterion of paragraph 7.3 during each of those tests conducted with a commanded steering wheel (5) angle of 5A or greater but limited as per paragraph 9.9.4, where A is the steering wheel angle computed in paragraph 9.6.1. Where a vehicle has been physically tested in accordance with paragraph 8, the compliance of versions or variants of that same vehicle type may be demonstrated by a computer simulation, which respects the test conditions of paragraph 8 and the test procedure of paragraph 9.9. The use of the simulator is defined in Annex 4 to this Regulation. 7.1. The yaw rate measured 1 second after completion of the Sine with Dwell steering input (time T0 + 1 in Figure 1) shall not exceed 35 per cent of the first peak value of yaw rate recorded after the steering wheel angle changes sign (between first and second peaks) ( in Figure 1) during the same test run. 7.2. The yaw rate measured 1,75 seconds after completion of the Sine with Dwell steering input shall not exceed twenty per cent of the first peak value of yaw rate recorded after the steering wheel angle changes sign (between first and second peaks) during the same test run. 7.3. The lateral displacement of the vehicle centre of gravity with respect to its initial straight path shall be at least 1,83 m for vehicles with a GVM of 3 500 kg or less, and 1,52 m for vehicles with a maximum mass greater than 3 500 kg when computed 1,07 seconds after the Beginning of Steer (BOS). BOS is defined in paragraph 9.11.6. May also be used to indicate the malfunction of related systems/functions, including traction control, trailer stability assist, corner brake control, and other similar functions that use throttle and/or individual torque control to operate and share common components with ESC. 7.4.3. The requirement of paragraph 7.4.1.3 does not apply to tell-tales shown in a common space. 7.4.4. The manufacturer may use the ESC malfunction tell-tale in a flashing mode to indicate the interventions of ESC and/or ESC-related systems (as listed in paragraph 7.4.1.5), the ESC intervention on the steering angle of one or more wheels for the purpose of vehicle stability. The manufacturer may include an ‘ESC Off’ control, which shall be illuminated when the vehicle's headlamps are activated, and which has a purpose to place the ESC system in a mode in which it will no longer satisfy the performance requirements of paragraphs 7, 7.1, 7.2 and 7.3. Manufacturers may also provide controls for other systems that have an ancillary effect upon ESC operation. Controls of either kind that place the ESC system in a mode in which it may no longer satisfy the performance requirements of paragraphs 7, 7.1, 7.2 and 7.3 are permitted, provided that the system also meets the requirements of paragraphs 7.5.1, 7.5.2 and 7.5.3. The vehicle is in a four-wheel drive configuration selected by the driver that is designed for operation at higher speeds on snow-, sand-, or dirt-packed roads and that has the effect of locking the drive gears at the front and rear axles together, provided that in this mode the vehicle meets the stability performance requirements of paragraphs 7.1 and 7.2 under the test conditions specified in paragraph 8. However, if the system has more than one ESC mode that satisfies the requirements of paragraphs 7.1 and 7.2 within the drive configuration selected for the previous ignition cycle, the ESC shall return to the manufacturer's original default ESC mode for that drive configuration at the initiation of each new ignition cycle. 7.5.2. A control, whose only purpose is to place the ESC system in a mode in which it will no longer satisfy the performance requirements of paragraphs 7, 7.1, 7.2 and 7.3, shall fulfil the relevant technical requirements of Regulation No 121. 7.5.3. A control for an ESC system whose purpose is to place the ESC system in different modes, at least one of which may no longer satisfy the performance requirements of paragraphs 7, 7.1, 7.2, and 7.3, shall fulfil the relevant technical requirements of Regulation No 121. Alternatively, in the case where the ESC system mode is controlled by a multi-functional control, the driver display shall identify clearly to the driver the control position for this mode using the ‘off’ symbol for electronic stability control system as defined in Regulation No 121. 7.5.4. A control for another system that has the ancillary effect of placing the ESC system in a mode in which it no longer satisfies the performance requirements of paragraphs 7, 7.1, 7.2 and 7.3 need not be identified by the ‘ESC Off’ symbol of paragraph 7.5.2. If the manufacturer elects to install a control to turn off or reduce the performance of the ESC system under paragraph 7.5, the tell-tale requirements of paragraphs 7.6.1 to 7.6.4 shall be met in order to alert the driver to the inhibited or reduced state of ESC system functionality. This requirement does not apply for the driver-selected mode referred to in paragraph 7.5.1.2. 7.6.1. 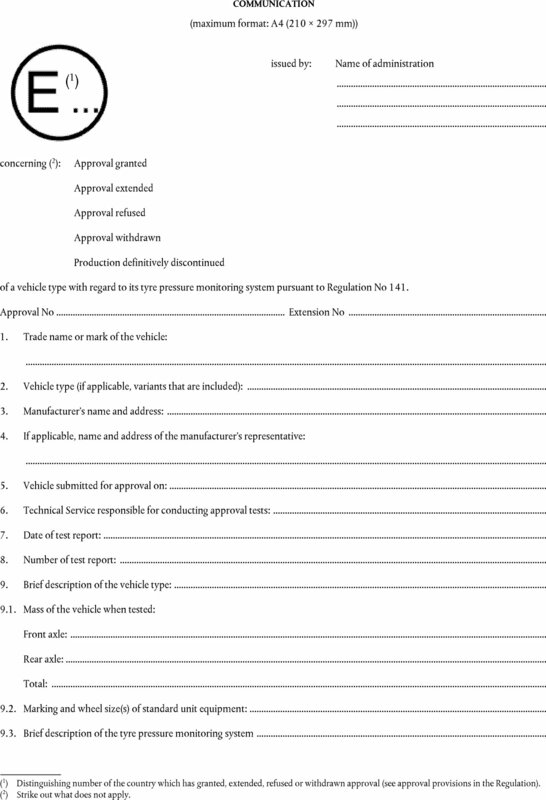 The vehicle manufacturer shall provide a tell-tale indicating that the vehicle has been put into a mode that renders it unable to satisfy the requirements of paragraphs 7, 7.1, 7.2 and 7.3, if such a mode is provided. Shall fulfil the relevant technical requirements of Regulation No 121. Except as provided in paragraphs 7.6.3 and 7.6.4 each ‘ESC Off’ tell-tale shall be activated as a check of lamp function either when the ignition locking system is turned to the ‘On’ (‘Run’) position when the engine is not running, or when the ignition locking system is in a position between ‘On’ (‘Run’) and ‘Start’ that is designated by the manufacturer as a check position. Shall extinguish after the ESC system has been returned to the manufacturer's original default mode. 7.6.3. The ‘ESC Off’ tell-tale need not be activated when a starter interlock is in operation. 7.6.4. The requirement of paragraph 7.6.2.3 of this section does not apply to tell-tales shown in a common space. 7.6.5. The manufacturer may use the ‘ESC Off’ tell-tale to indicate an ESC level of function other than the manufacturer's original default mode even if the vehicle would meet paragraphs 7, 7.1, 7.2 and 7.3 of this section at that level of ESC function. The documentation package shall, as confirmation that the vehicle is equipped with an ESC system that meets the definition of an ‘ESC System’ as in paragraph 2.7 to this Regulation, include the vehicle manufacturer's documentation as specified in paragraphs 7.7.1 to 7.7.4 below. 8.1.2. The maximum wind speed is no greater than 10 m/s for vehicles with SSF > 1,25, and 5 m/s for vehicles with SSF ≤ 1,25. The k-test method specified in Appendix 2 to Annex 6 of Regulation No 13-H.
Vehicles with a mass in running order under 1 588 kg shall be equipped with ‘lightweight’ outriggers. Lightweight outriggers shall be designed with a maximum mass of 27 kg and a maximum roll moment of inertia of 27 kg · m2. Vehicles with a mass in running order between 1 588 kg and 2 722 kg shall be equipped with ‘standard’ outriggers. Standard outriggers shall be designed with a maximum mass of 32 kg and a maximum roll moment of inertia of 35,9 kg · m2. Vehicles with a mass in running order equal to or greater than 2 722 kg shall be equipped with ‘heavy’ outriggers. Heavy outriggers shall be designed with a maximum mass of 39 kg and a maximum roll moment of inertia of 40,7 kg · m2. 8.3.5. Automated steering machine. A steering robot programmed to execute the required steering pattern shall be used in paragraphs 9.5.2, 9.5.3, 9.6 and 9.9. The steering machine shall be capable of supplying steering torques between 40 to 60 Nm. The steering machine shall be able to apply these torques when operating with steering wheel velocities up to 1 200 degrees per second. 9.2. Tell-tale bulb check. With the vehicle stationary and the ignition locking system in the ‘Lock’ or ‘Off’ position, switch the ignition to the ‘On’ (‘Run’) position or, where applicable, the appropriate position for the lamp check. The ESC malfunction tell-tale shall be illuminated as a check of lamp function, as specified in paragraph 7.4.1.3, and if equipped, the ‘ESC Off’ tell-tale shall also be illuminated as a check of lamp function, as specified in paragraph 7.6.2.3. The tell-tale bulb check is not required for a tell-tale shown in a common space as specified in paragraphs 7.4.3 and 7.6.4. 9.3. ‘ESC Off’ control check. For vehicles equipped with an ‘ESC Off’ control, with the vehicle stationary and the ignition locking system in the ‘Lock’ or ‘Off’ position, switch the ignition locking system to the ‘On’ (‘Run’) position. Activate the ‘ESC Off’ control and verify that the ‘ESC Off’ tell-tale is illuminated, as specified in paragraph 7.6.2. Turn the ignition locking system to the ‘Lock’ or ‘Off’ position. Again, switch the ignition locking system to the ‘On’ (‘Run’) position and verify that the ‘ESC Off’ tell-tale has extinguished indicating that the ESC system has been restored as specified in paragraph 7.5.1. Condition the vehicle brakes in the manner described in paragraphs 9.4.1 to 9.4.4. 9.4.1. Ten stops are performed from a speed of 56 km/h, with an average deceleration of approximately 0,5 g.
9.4.3. When executing the stops in paragraph 9.4.2, sufficient force is applied to the brake pedal to bring the vehicle's antilock braking system (ABS) into operation for a majority of each braking event. 9.4.4. Following completion of the final stop in 9.4.2, the vehicle is driven at a speed of 72 km/h for five minutes to cool the brakes. Condition the tyres using the procedure of paragraphs 9.5.1 to 9.5.3 to wear away mould sheen and achieve operating temperature immediately before beginning the test runs of paragraphs 9.6 and 9.9. 9.5.1. The test vehicle is driven around a circle 30 meters in diameter at a speed that produces a lateral acceleration of approximately 0,5 to 0,6 g for three clockwise laps followed by three anticlockwise laps. 9.5.2. Using a sinusoidal steering pattern at a frequency of 1 Hz, a peak steering wheel angle amplitude corresponding to a peak lateral acceleration of 0,5 to 0,6 g, and a vehicle speed of 56 km/h, the vehicle is driven through four passes performing 10 cycles of sinusoidal steering during each pass. The vehicle is subjected to two series of runs of the slowly increasing steer test using a constant vehicle speed of 80 ± 2 km/h and a steering pattern that increases by 13,5 degrees per second until a lateral acceleration of approximately 0,5 g is obtained. Three repetitions are performed for each test series. One series uses anticlockwise steering, and the other series uses clockwise steering. The maximum time permitted between each test run is five minutes. 9.6.1. From the slowly increasing steer tests, the quantity ‘A’ is determined. ‘A’ is the steering wheel angle in degrees that produces a steady state lateral acceleration (corrected using the methods specified in paragraph 9.11.3) of 0,3 g for the test vehicle. Utilising linear regression, A is calculated, to the nearest 0,1 degrees, from each of the six slowly increasing steer tests. The absolute value of the six A values calculated is averaged and rounded to the nearest 0,1 degrees to produce the final quantity, A, used below. 9.7. After the quantity A has been determined, without replacing the tyres, the tyre conditioning procedure described in paragraph 9.5 is performed again immediately prior to conducting the Sine with Dwell test of paragraph 9.9. Initiation of the first Sine with Dwell test series shall begin within two hours after completion of the slowly increasing steer tests of paragraph 9.6. 9.8. Check that the ESC system is enabled by ensuring that the ESC malfunction and ‘ESC Off’ (if provided) tell-tales are not illuminated. The vehicle is subjected to two series of test runs using a steering pattern of a sine wave at 0,7 Hz frequency with a 500 ms delay beginning at the second peak amplitude as shown in Figure 2 (the Sine with Dwell tests). One series uses anticlockwise steering for the first half cycle, and the other series uses clockwise steering for the first half cycle. The vehicle is allowed to cool-down between each test runs for a period of 1,5 to 5 minutes, with the vehicle stationary. 9.9.2. The steering amplitude for the initial run of each series is 1,5 A, where A is the steering wheel angle determined in paragraph 9.6.1. 9.9.3. In each series of test runs, the steering amplitude is increased from run to run, by 0,5 A, provided that no such run will result in a steering amplitude greater than that of the final run specified in paragraph 9.9.4. 9.9.4. The steering amplitude of the final run in each series is the greater of 6,5 A or 270 degrees, provided the calculated magnitude of 6,5 A is less than or equal to 300 degrees. If any 0,5 A increment, up to 6,5 A, is greater than 300 degrees, the steering amplitude of the final run shall be 300 degrees. 9.10.2. With the vehicle initially stationary and the ignition locking system in the ‘Lock’ or ‘Off’ position, switch the ignition locking system to the ‘Start’ position and start the engine. Drive the vehicle forward to obtain a vehicle speed of 48 ± 8 km/h. 30 seconds, at the latest, after the engine has been started and within the next two minutes at this speed, conduct at least one left and one right smooth turning manoeuvre without losing directional stability and one brake application. Verify that the ESC malfunction indicator illuminates in accordance with paragraph 7.4 by the end of these manoeuvres. 9.10.3. Stop the vehicle, switch the ignition locking system to the ‘Off’ or ‘Lock’ position. After a five-minute period, switch the vehicle's ignition locking system to the ‘Start’ position and start the engine. Verify that the ESC malfunction indicator again illuminates to signal a malfunction and remains illuminated as long as the engine is running or until the fault is corrected. 9.10.4. Switch the ignition locking system to the ‘Off’ or ‘Lock’ position. Restore the ESC system to normal operation, switch the ignition system to the ‘Start’ position and start the engine. Re-perform the manoeuvre described in paragraph 9.10.2 and verify that the tell-tale has extinguished within this time or immediately afterwards. Yaw rate and lateral displacement measurements and calculations shall be processed utilising the techniques specified in paragraphs 9.11.1 to 9.11.8. 9.11.1. Raw steering wheel angle data is filtered with a 12-pole phaseless Butterworth filter and a cut-off frequency of 10 Hz. The filtered data is then zeroed to remove sensor offset utilising static pre-test data. 9.11.2. Raw yaw rate data is filtered with a 12-pole phaseless Butterworth filter and a cut-off frequency of 6 Hz. The filtered data is then zeroed to remove sensor offset utilising static pre-test data. 9.11.3. Raw lateral acceleration data is filtered with a 12-pole phaseless Butterworth filter and a cut-off frequency of 6 Hz. The filtered data is then zeroed to remove sensor offset utilising static pre-test data. The lateral acceleration data at the vehicle centre of gravity is determined by removing the effects caused by vehicle body roll and by correcting for sensor placement via the use of coordinate transformation. For data collection, the lateral accelerometer shall be located as close as possible to the position of the vehicle's longitudinal and lateral centres of gravity. 9.11.4. Steering wheel velocity is determined by differentiating the filtered steering wheel angle data. The steering wheel velocity data is then filtered with a moving 0,1 second running average filter. 9.11.5. Lateral acceleration, yaw rate and steering wheel angle data channels are zeroed utilising a defined ‘zeroing range’. The methods used to establish the zeroing range are defined in paragraphs 9.11.5.1 and 9.11.5.2. 9.11.5.1. Using the steering wheel rate data calculated using the methods described in paragraph 9.11.4, the first instant that the steering wheel rate exceeds 75 deg/sec is identified. From this point, steering wheel rate shall remain greater than 75 deg/sec for at least 200 ms. If the second condition is not met, the next instant that the steering wheel rate exceeds 75 deg/sec is identified and the 200 ms validity check applied. This iterative process continues until both conditions are ultimately satisfied. 9.11.5.2. The ‘zeroing range’ is defined as the 1,0 second time period prior to the instant the steering wheel rate exceeds 75 deg/sec (i.e. the instant the steering wheel velocity exceeds 75 deg/sec defines the end of the ‘zeroing range’). 9.11.6. The Beginning of Steer (BOS) is defined as the first instance when the filtered and zeroed steering wheel angle data reaches -5 degrees (when the initial steering input is anticlockwise) or +5 degrees (when the initial steering input is clockwise) after a time defining the end of the ‘zeroing range.’ The value for time at the BOS is interpolated. 9.11.8. 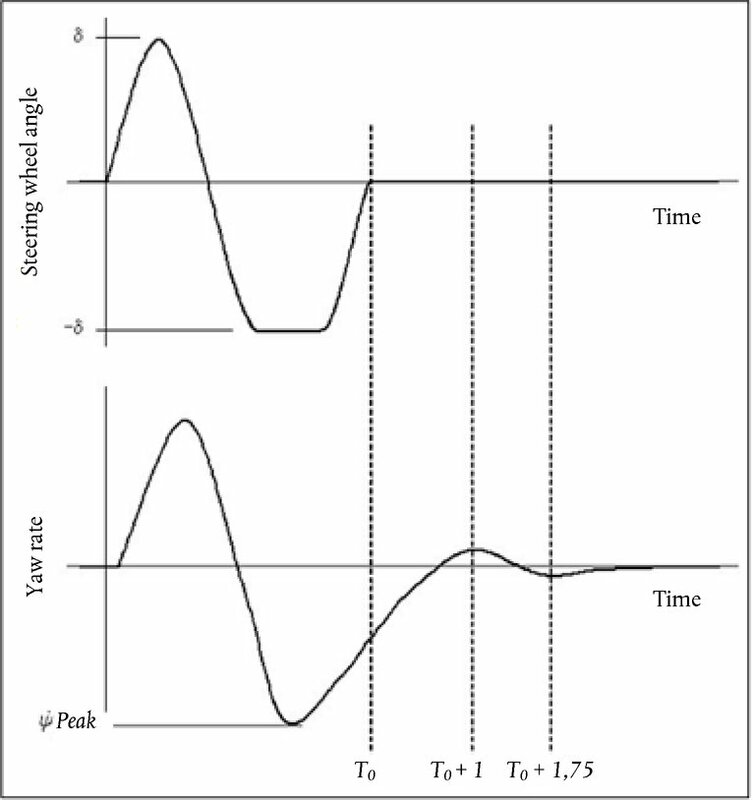 The second peak yaw rate is defined as the first local yaw rate peak produced by the reversal of the steering wheel. The yaw rates at 1,0 and 1,75 seconds after COS are determined by interpolation. 9.11.9. Determine lateral velocity by integrating corrected, filtered and zeroed lateral acceleration data. Zero lateral velocity at the BOS point. Determine lateral displacement by integrating zeroed lateral velocity. Zero lateral displacement at the BOS point. The lateral displacement measurement is made at 1,07 seconds after BOS point and is determined by interpolation. A vehicle approved to this Regulation shall be so manufactured as to conform to the type approved by meeting the requirements set forth in paragraphs 5, 6 and 7 above. The Type Approval Authority which has granted type approval may at any time verify the conformity control methods applied in each production facility. The normal frequency of these verifications shall be once every two years. 12.1. The approval granted in respect of a vehicle type pursuant to this Regulation may be withdrawn if the requirements laid down in paragraph 8.1 above are not complied with. (2) An axle group shall be treated as a single axle and dual wheels shall be treated as a single wheel. (4) An axle group shall be treated as a single axle and dual wheels shall be treated as a single wheel. (5) The text in this Regulation assumes that the vehicle steering is controlled by means of a steering wheel. Vehicles using other types of steering control may also be approved to this annex provided the manufacturer is able to demonstrate to the Technical Service that the performance requirements of this Regulation can be met using equivalent steering inputs to the steering inputs stipulated under paragraph 7. of this Regulation. (6) The ‘nominal’ value is understood as being the theoretical target value. The above approval mark affixed to a vehicle shows that the vehicle type concerned has been approved in Belgium (E 6) with regard to the Electronic Stability Control pursuant to Regulation No 140. The first two digits of the approval number indicate that the approval was granted in accordance with the requirements of Regulation No 140 in its original form. The above approval mark affixed to a vehicle shows that the vehicle type concerned has been approved in Belgium (E 6) pursuant to Regulations Nos 140 and 24 (1). (In the case of the latter Regulation the corrected absorption coefficient is 1,30 m-1). The approval numbers indicate that, at the dates when the respective approvals were given, Regulation No 140 was in its original form and Regulation No 24 included the 02 series of amendments. 1.1. The vehicle stability function shall be demonstrated by the vehicle manufacturer to the Type Approval Authority or Technical Service by simulating the dynamic manoeuvres of paragraph 9.9 of this Regulation. The lateral displacement of the vehicle centre of gravity with respect to its initial straight path. 1.3. The simulation shall be carried out with a validated modelling and simulation tool and using the dynamic manoeuvres of paragraph 9.9 of this Regulation under the test conditions of paragraph 8 of this Regulation. The electronic control box in a hardware-in-the-loop configuration. 2.1. The validity of the applied modelling and simulation tool shall be verified by means of comparisons with practical vehicle tests. The tests utilised for the validation shall be the dynamic manoeuvres of paragraph 9.9 of this Regulation. 2.3. The simulator shall be deemed to be validated when its output is comparable to the practical test results produced by a given vehicle type during the dynamic manoeuvres of paragraph 9.9 of this Regulation. The relationship of activation and sequence of the vehicle stability function in the simulation and in the practical vehicle test shall be the means of making the comparison. 5. This test has been carried out and the results reported in accordance with Annex 4 to Regulation No 140. (1) To be signed by different persons if the Technical Service and the Type Approval Authority is the same organization. This Regulation applies to the approval of vehicles of category M1 up to a maximum mass of 3 500 kg and N1 (1) when equipped with a tyre pressure monitoring system, except for vehicles fitted with dual wheels on an axle. ‘Approval of a vehicle’ means the approval of a vehicle type with regard to its tyre pressure monitoring system. The design of the tyre pressure monitoring system. ‘Test Pressure (Ptest)’ means the actual pressure of the tyre(s) selected for each tyre position after deflation during the test procedure. 3.3. A vehicle representative of the vehicle type to be approved shall be submitted to the Type Approval Authority or the Technical Service responsible for conducting the approval tests. 4.1. If the vehicle submitted for approval pursuant to this Regulation meets all the requirements of paragraph 5. below, approval of that vehicle type shall be granted. 4.2. An approval number shall be assigned to each type approved. Its first two digits (at present 00 for the regulation in its original form) shall indicate the series of amendments incorporating the most recent major technical amendments made to the regulation at the time of issue of the approval. The same Contracting Party may not assign the same number to another type of vehicle. 4.3. Notice of approval or of extension or of refusal of approval of a vehicle type pursuant to this Regulation shall be communicated to the Contracting Parties to the Agreement which apply this Regulation by means of a form conforming to the model in Annex 1 to this Regulation. The number of this Regulation, followed by the letter ‘R’, a dash and the approval number to the right of the markings prescribed in paragraph 4.4.1. 4.5. If the vehicle conforms to a vehicle type approved, under one or more regulations annexed to the Agreement, in the country which granted approval under this Regulation, the symbol prescribed in paragraph 4.4.1 need not be repeated; in such a case, the regulation and approval numbers and the additional symbols for all the regulations under which approval has been granted in the country which granted approval under this Regulation shall be placed in vertical columns to the right of the symbol prescribed in paragraph 4.4.1. 4.8. Annex 2 to this Regulation gives examples of approval marks. 5.1.1. Any vehicle of categories M1 up to 3,500 kg and N1, in both cases with all axles equipped with single tyres, and fitted with a tyre pressure monitoring system complying with the definition of paragraph 2.7 shall meet the performance requirements contained in paragraphs 5.1.2 to 5.5.5 of this Regulation over a wide range of road and environmental conditions encountered within the territory of the Contacting Parties. 5.1.3. The system shall operate from a speed of 40 km/h or below, up to the vehicle's maximum design speed. 5.1.4. The vehicle shall fulfil the tests (puncture, diffusion and malfunction) as specified in Annex 3. 5.2. Tyre pressure detection for incident-related pressure loss. 5.2.1. The TPMS shall illuminate the warning signal described in paragraph 5.5 within not more than ten minutes of cumulative driving time after the in service operating pressure in one of the vehicle's tyres has been reduced by twenty per cent or it is at a minimum pressure of 150 kPa, whatever is higher. 5.3. Detection for a tyre pressure level significantly below the recommended pressure for optimum performance including fuel consumption and safety. 5.3.1. The TPMS shall illuminate the warning signal described in paragraph 5.5 within not more than sixty minutes of cumulative driving time after the in-service operating pressure in any of the vehicle's tyres, up to a total of four tyres, has been reduced by twenty per cent or it is at a minimum pressure of 150 kPa, whatever is higher. 5.4.1. The TPMS shall illuminate the warning signal described in paragraph 5.5 not more than 10 minutes after the occurrence of a malfunction that affects the generation or transmission of control or response signals in the vehicle's tyre pressure monitoring system. 5.5.1. The warning indication shall be by means of an optical warning signal conforming to Regulation No 121. 5.5.2. The warning signal shall be activated when the ignition (start) switch is in the ‘on’ (run) position (bulb check). This requirement does not apply to tell-tales shown in a common space. 5.5.3. The warning signal must be visible even by daylight; the satisfactory condition of the signal must be easily verifiable by the driver from the driver's seat. 5.5.4. The malfunction indication may be the same warning signal as the one used to indicate under-inflation. If the warning signal described in paragraph 5.5.1 is used to indicate both under-inflation and a malfunction of the TPMS, the following shall apply: with the ignition (start) switch in the ‘on’ (run) position the warning signal shall flash to indicate a malfunction. After a short period of time the warning signal shall remain continuously illuminated as long as the malfunction exists and the ignition (start) switch is in the ‘on’ (run) position. The flashing and illumination sequence shall be repeated each time the ignition (start) switch is in the ‘on’ (run) position until the malfunction has been corrected. 5.5.5. The tell-tale of the warning described in paragraph 5.5.1 may be used in a flashing mode in order to provide information about the reset status of the tyre pressure monitoring system in accordance with the owner's manual of the vehicle. A statement that the vehicle is equipped with such a system (and information how to reset the system, if the actual system includes such a feature). An image of the tell-tale symbol described in paragraph 5.5.1 (and an image of the malfunction tell-tale symbol, if a dedicated tell-tale is used for this function). Additional information about the significance of the low tyre pressure warning tell-tale illuminating and a description of the corrective action to be undertaken if this happens. 6.2. If no owner's manual is supplied with the vehicle, the information required in paragraph 6.1 above shall be displayed in a prominent place on the vehicle. Consider that the modifications made affect the conditions of the granting of the approval and require further tests or additional checks before granting an extension of approval. 7.2. Confirmation or refusal of approval, specifying the alterations, shall be communicated by the procedure specified in paragraph 4.3 above to the Contracting Parties to the Agreement applying this Regulation. 7.3. The Type Approval Authority shall inform the other Contracting Parties of the extension by means of the communication form which appears in Annex 1 to this Regulation. It shall assign a serial number to each extension, to be known as the extension number. 8.2. The Type Approval Authority which has granted type approval, may at any time verify the conformity of production in each production facility. The normal frequency of these verifications shall be at least once per year. 9.1. The approval granted in respect of a vehicle type pursuant to this Regulation may be withdrawn if the requirements laid down in paragraph 8 are not complied with. 9.2. If a Contracting Party to the Agreement, which applies this Regulation, withdraws an approval it has previously granted, it shall forthwith so notify the other Contracting Parties applying this Regulation, by means of a copy of the approval form bearing at the end, in large letters, the signed and dated annotation ‘APPROVAL WITHDRAWN’. If the holder of the approval completely ceases to manufacture a type of vehicle approved in accordance with this Regulation, he shall so inform the authority which granted the approval. Upon receiving the relevant communication that authority shall inform thereof the other Contracting Parties to the Agreement applying this Regulation by means of a copy of the approval form bearing at the end, in large letters, the signed and dated annotation ‘PRODUCTION DISCONTINUED’. The Contracting Parties to the Agreement which apply this Regulation shall communicate to the United Nations Secretariat the names and addresses of the Technical Services responsible for conducting approval tests and of the Type Approval Authorities which grant approval and to which forms certifying approval or extension or refusal or withdrawal of approval, issued in other countries, are to be sent. (1) As defined in the Consolidated Resolution on the Construction of Vehicles (R.E.3. ), document ECE/TRANS/WP.29/78/Rev.6, para. 2 - www.unece.org/trans/main/wp29/wp29wgs/wp29gen/wp29resolutions.html. of a vehicle type with regard to its tyre pressure monitoring system pursuant to Regulation No 141. 17. The list of documents deposited with the Type Approval Authority which has granted approval is annexed to this communication and can be obtained upon request. The above approval mark affixed to a vehicle shows that the vehicle type concerned has, with regard to the equipment of a tyre pressure monitoring system, been approved in the Netherlands (E 4), pursuant to Regulation No 141 under approval number 002439. The approval number indicates that the approval was granted in accordance with the requirements of Regulation No 141 in its original form. The ambient temperature shall be between 0 °C and 40 °C. The road shall have a surface affording good adhesion. The road surface shall be dry during testing. 1.3. The tests shall be conducted in an environment free of interferences from radio wave. The vehicle may be tested at any condition of load, the distribution of the mass among the axles being that stated by the vehicle manufacturer without exceeding any of the maximum permissible mass for each axle. However, in the case where there is no possibility to set or reset the system, the vehicle shall be unladen. There may be, in addition to the driver, a second person on the front seat who is responsible for noting the results of the tests. The load condition shall not be modified during the test. In a speed range from forty km/h and 100 km for the diffusion test to verify the requirements of paragraph 5.3 to this Regulation and for the malfunction test to verify the requirements of paragraph 5.4 to this Regulation. The whole speed range shall be covered during the test. For vehicles equipped with cruise control, the cruise control shall not be engaged during testing. The vehicle rims may be positioned at any wheel position, consistent with any related instructions or limitations from the vehicle's manufacturer. When the vehicle is parked, the vehicle's tyres shall be shaded from direct sun. The location shall be shielded from any wind that may affect the results. Driving time shall not accumulate during service brake application while the vehicle is moving. The vehicle shall be tested with the tyres installed on the vehicle according to the vehicle manufacturer's recommendation. However, the spare tyre may be utilised for testing TPMS malfunction. 1.5. Accuracy of pressure measurement equipment. Pressure measurement equipment to be used for the tests contained in this annex shall be accurate to at least +/– 3kPa. The test shall be performed at a test speed within the range in accordance with paragraph 1.4.2 to this annex, at least once for the test case according to paragraph 2.6.1 to this annex (‘puncture test’), and at least once for each test case according to paragraph 2.6.2 to this annex (‘diffusion test’). 2.1. Before inflating the vehicle's tyres, leave the vehicle stationary outside at ambient temperature with the engine off shaded from direct sunlight and not exposed to wind or other heating or chilling influences for at least one hour. Inflate the vehicle's tyres to the vehicle manufacturer's recommended cold inflation pressure (Prec), in accordance with the vehicle manufacturer's recommendation for the speed and load conditions, and tyre positions. All pressure measurements shall be carried out using the same test equipment. 2.2. With the vehicle stationary and the ignition locking system in the ‘Lock’ or ‘Off’ position, activate the ignition locking system to the ‘On’ or ‘Run’ position. The tyre pressure monitoring system shall perform a check of lamp function for the low tyre pressure tell-tale as specified in paragraph 5.5.2 of this Regulation. This last requirement does not apply to tell-tales shown in a common space. 2.3. If applicable, set or reset the tyre pressure monitoring system in accordance with the vehicle manufacturer's recommendations. 2.4.1. Drive the vehicle for a minimum of twenty minutes within the speed range in paragraph 1.4.2 to this annex, and with an average speed of eighty km/h (± 10 km/h). It is allowed to be outside the speed range for a maximum cumulative time of two minutes during the learning phase. 2.4.2. At the discretion of the Technical Service, where the driving test is undertaken on a track (circle/oval) with only turns in a single direction, then the driving test in paragraph 2.4.1 above should be equally split (+/– 2 minutes) in both directions. 2.4.3. Within the five minutes of completing the learning phase, measure the warm pressure of the tyre(s) to be deflated. The warm pressure shall be taken as the value Pwarm. This value will be used for subsequent operations. 2.5.1. Procedure for the puncture test to verify the requirements of paragraph 5.2 to this Regulation. Deflate one of the vehicle's tyres within five minutes of measuring the warm pressure as described in paragraph 2.4.3 above, until it is at Pwarm – 20 per cent, or it is at a minimum pressure of 150 kPa, whichever is higher, namely Ptest. Following a stabilisation period of between two and five minutes the pressure Ptest shall be rechecked and adjusted if necessary. 2.5.2. Procedure for the diffusion test to verify the requirements of paragraph 5.3 to this Regulation. Deflate all four tyres within five minutes of measuring the warm pressure as described in paragraph 2.4.3 above, until the deflated tyres are at Pwarm – 20 per cent plus a further deflation of 7 kPa, namely Ptest. Following a stabilisation period of between two and five minutes the pressure Ptest shall be rechecked and adjusted if necessary. 2.6. Low tyre pressure detection phase. 2.6.1. 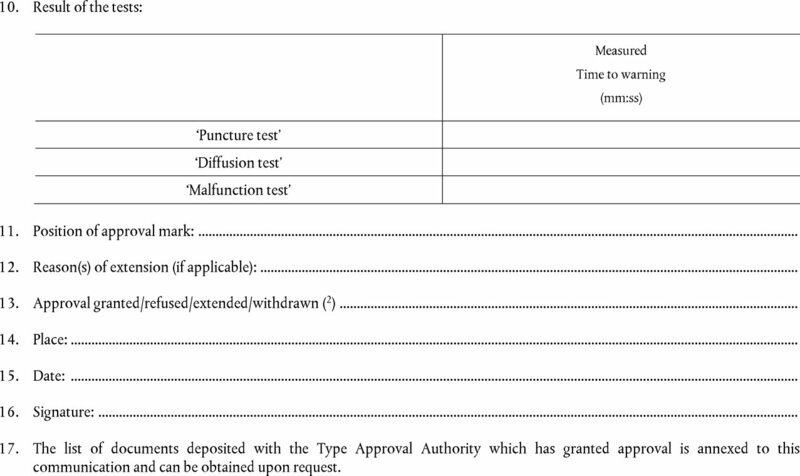 Procedure for the puncture test to verify the requirements of paragraph 5.2 to this Regulation. 2.6.1.1. Drive the vehicle along any portion of the test course (not necessarily continuously). The sum of the total cumulative drive time shall be the lesser of 10 minutes or the time at which the low tyre pressure tell-tale illuminates. 2.6.2. Procedure for the diffusion test to verify the requirements of paragraph 5.3 to this Regulation. 2.6.2.1. Drive the vehicle along any portion of the test course. After not less than twenty (20) minutes and not more than forty (40) minutes bring the vehicle to a complete standstill with the engine switched off and the ignition key removed for not less than one (1) minute or more than three (3) minutes. Resume the test. The sum of the total cumulative drive time shall be the lesser of sixty (60) minutes of cumulative driving under the conditions set out in paragraph 1.4.2 above or the time at which the low tyre pressure tell-tale illuminates. 2.6.3. If the low tyre pressure signal did not illuminate, discontinue the test. 2.7. If the low tyre pressure tell-tale illuminated during the procedure in paragraph 2.6 above, deactivate the ignition locking system to the ‘Off’ or ‘Lock’ position. After a five minutes period, reactivate the vehicle's ignition locking system to the ‘On’ (‘Run’) position. The tell-tale must illuminate and remain illuminated as long as the ignition locking system is in the ‘On’ (‘Run’) position. 2.8. Inflate all of the vehicle's tyres to the vehicle manufacturer's recommended cold inflation pressure. Reset the system in accordance with the instructions of the vehicle manufacturer. Determine whether the tell-tale has extinguished. If necessary, drive the vehicle until the tell-tale has been extinguished. If the tell-tale does not extinguish, discontinue the test. 2.9. Repetition of the deflation phase. 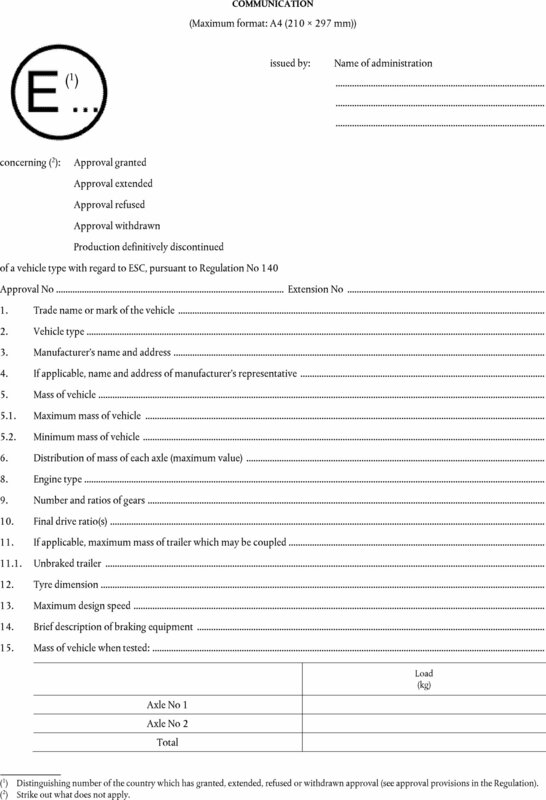 The test may be repeated, at the same or different loads, using the relevant test procedures in paragraphs 2.1 to 2.8 above, with the relevant tyre(s) on the vehicle under-inflated, in accordance with the provisions of paragraph 5.2 or 5.3 to this Regulation, whichever is relevant. 3.1. Simulate a TPMS malfunction, for example, by disconnecting the power source to any TPMS component, disconnecting any electrical connection between TPMS components, or installing a tyre or wheel on the vehicle that is incompatible with the TPMS. When simulating a TPMS malfunction, the electrical connections for the tell-tale lamps shall not be disconnected. 3.2. Drive the vehicle for up to ten minutes of cumulative time (not necessarily continuously) along any portion of the test course. 3.3. The sum of the total cumulative drive time under paragraph 3.2 shall be the lesser of ten minutes or the time at which the TPMS malfunction tell-tale illuminates. 3.4. If the TPMS malfunction indicator did not illuminate in accordance with paragraph 5.4 to this Regulation, as required, discontinue the test. 3.5. If the TPMS malfunction indicator is illuminated or illuminates during the procedure in paragraphs 3.1 to 3.3 above, deactivate the ignition locking system to the ‘Off’ or ‘Lock’ position. After five minutes, reactivate the vehicle's ignition locking system to the ‘On’ (‘Run’) position. The TPMS malfunction indicator shall again signal a malfunction and remain illuminated as long as the ignition locking system is in the ‘On’ (‘Run’) position. 3.6. Restore the TPMS to normal operation. If necessary, drive the vehicle until the warning signal has extinguished. If the warning lamp has not extinguished, discontinue the test. 3.7. The test may be repeated using the test procedures in paragraphs 3.1 to 3.6 above, with each such test limited to simulation of a single malfunction.